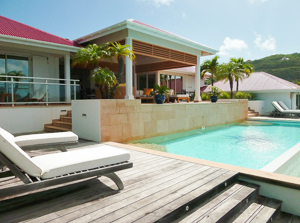 Villa UJV 283, also known as Villa Festiva is a very private and spectacular 3 bedroom villa situated on Pointe Milou, St Barts. There is an infinity pool with large heated spa dramatically nestled into the cliff side with views over the ocean. There is a lot of outdoor space with a covered dining and living area with high quality wicker furniture and white cushions. The inside living room has a simple and comfortable décor with white and cream fabrics and local art on the wall. The well-equipped kitchen is a part of the living room and breakfast bar that opens to the outdoor living area, the pool and the view. Two of the bedrooms open to the wonderful view, and the third bedroom, which is smaller, is at the entrance of the villa with its own private terrace. This villa is best suited for two couples or a family.